He was so helpful in the process of ordering the headphones, tracking them, and getting them set up once the party day arrived. But we really didn’t even need help setting up, thats how EASY his equipment is to use! And everyone had the best time. The Silent Disco was great and was the hit of the party! The DJ executed silent disco very well and had very positive comments about the experience. The DJ said in his 20 years of experience, he had not seen such a high level and cosistent amount of audience participation until Silent Disco. It was very easy for me to create some custom playlists for the other channel as well. I am super impressed with your company! Our family LOVED the silent disco party at our reunion gathering. Most had never done this before, but from first moment of putting on the headphones, everyone was hooked on the fun. Everyone danced and sang for a good 4+ hours inside, outside…it was a blast. Thanks for your prompt shipping, easy set up, good suggestions, easy return process, and prompt security deposit refund. We will highly recommend you to others in search of the best party ever. The party went super well! The headphones were super easy to use and we had no issues with them! Everyone loved them, especially the younger kids. They are in the mail on their way back. Honestly there’s nothing you could do to make it any better. You were the best price I found and included shipping which was amazing! My students absolutely loved the silent disco and were begging to do it again. I will definitely be using you again and am telling everyone I know to have an event! Thanks again and I look forward to working with you for my next one! My family LOVED it!!!! That’s all they could talk about was the party. It was interesting because the older family members didn’t quite understand the fun in it when I described it to them. Once they got the headphones on, they had way more fun than the younger folks. It was hilarious! Needless to say, this definitely got the stamp of approval. They are looking forward to hosting another one! We will be back to work with you for sure! Thank you for everything!!!! The Silent Dico was very successful!! Thanks for all your help making it happen! I will be dropping of fthe package for return tomorrow afternoon. It was epic. I cannot tell you how much fun we had and how great the silent disco worked out. I am going to cry when I mail them back to you. I want to keep them. But alas, they are all boxed up and I just need to tape and take them to the fed ex store. I seriously can’t tell you what a happy customer I am. We didn’t have one problem with any of the equipment and the quality was fantastic. I have thrown A LOT of parties, and this by far was the most fun we’ve ever had. AND no police came to quiet us down. That is a miracle. One of the funniest parts of the evening was looking over and seeing the entire catering staff lines up laughing and taking videos of all of us dancing fools. You will be getting lots of calls from Orange County if how many people asked for your name is any indication. Thanks so much for all of your help and great service making this happen. Thanks for the follow up – we used it tonight, and the kids LOVED it. Easy to set up, you gave all the instructions we needed, and had plenty of cables. All the units we used had plenty of charge. Great stuff. Will be shipping them back ASAP. Thanks again – pleasure working with you. It went so well! The idea was a hit, we used all of our headphones and attendees want us to do more Silent Disco events in the future. We packed up all of the headphones and sent them out through FedEx yesterday so they should be arriving to you soon. During our recent Youth Entrepreneurship Summit over 400 students took short segments away from the conference to relax. Silent Disco is the perfect millennial way to stretch your legs. 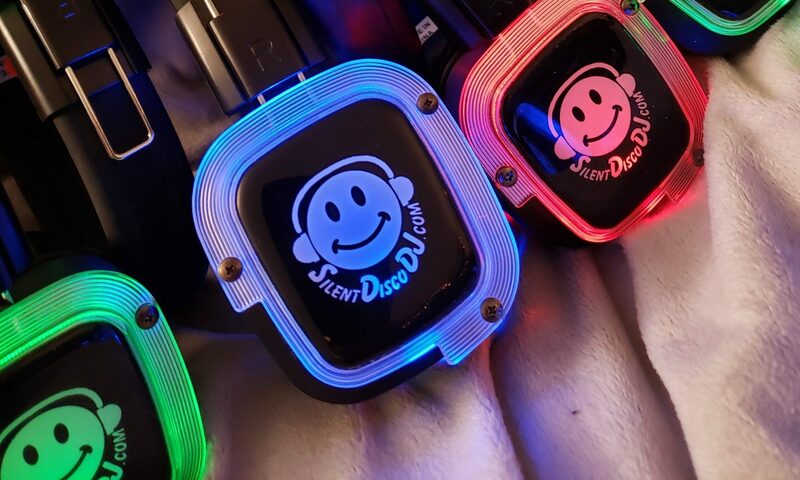 Silent Disco was a big hit and we will be sure to include it for conferences we have in the future. I love to DJ for Silent Disco Parties! 750 headphones from www.silent-disco-rental.com at the Camp Greensky Music Festival. All went very well. The equipment was easy to set up and everything worked very well. It was fun having up to 3 channels and the different colors to know who was dancing to what. A fun time! Thanks for answering all my questions. The silent disco was a huge hit, I made three playlists to suit different age ranges and everybody was on their feet before long. I enjoyed it immensely and it was as easy to set up as advertised. The sound quality was good, no static, and the range was impressive. Our event was elevated so much by the silent disco! We are so thankful that we got ahold of you and your team. Hi! The party was awesome- thank you! The headphones are already on their way back to you… Your instructions were very clear and it was easy. Thank you so much! Will definitely recommend you! It was great (and super easy!) working with you and I hope to get a chance to use your services again in the future. Thank you for great service and communication. My friends enjoyed the party so much they want me to do it again. We were outside in a big field so people were dancing while playing frisbee and soccer, kids were roaming around like wild animals with headsets, and moms of babies could blast their music without a care. The silent disco was an absolute HIT! Everyone loved it. The client should have booked a larger quantity though. They had more people than expected, but everyone still had a blast! I only used the red and blue transmitters. Thank you for everything! I just dropped the shipment at FedEx. Tracking number is 790839657027. Can’t wait to book with you again! You really made everything so easy! Until next time, my friend! Hi DJ Johnny!!! The party was a success. Everybody loved it!!!! They loved it so much that my friends will be contacting you for their house warming party! 🙂 I gave you awesome recommendations. Thank you for being so responsive. Equipment worked great! A total privilege working with you, Thanks so much for being amazing! Thanks again and hopefully we can do it again sometime? The pleasure was mine! The entire party was such a hit and I will definitely do this again!!!! And I definitely will be contacting you again. I also gave your info to my friends, I really hope they contact you soon 🙂 it was soooo great working with you. I loved that you were super responsive and a lot of fun to communicate with! The equipment was clean and all set up. Thank you for making my evening the event of the year! Everyone loved it. This whole process was super easy! Thanks for making it so stress-free. The headphones were a hit and probably the best part of our wedding! I just dropped the package off at FedEx. We had a great time at Tanya’s birthday and the silent disco turned out amazing!! A reminder that Christian added one of his headphones in our box. His is the one with the wire connected to it. Please confirm when you receive the package. Good morning, I just wanted to let you know that I have dropped the headphones off at FedEx and you should be receiving them back soon. I also want to say thank you for your business. I received them very fast and when I opened the box everything was organized and very simple. The kids really loved the party and the headphones were a hit!!! I look forward to booking with you again!!! Our event was a huge success. Everyone loved the evening. Thanks so much for the rentals! Loved how easy it was and how everything arrived ready to go. I can’t wait to plan another event and will definitely contact you for rentals again! It worked so easily and amazing and we had the best time. And everyone was like “I need to do this for my party” hahah, so I recommended you to them! You really can’t beat the price for how much fun that was! I shipped back your equipment. Many thanks. Everything worked out great. Simple to install; great sound, lots of fun! Just dropped off your gear, here at Flagstaff FedEx. Receipt pic attached. Everything worked flawlessly, zero issues. Kids thru adults dancing into the night, at the rim of the grand canyon, where amplified music is prohibited. Even guests who aren’t normally inclined to dance joined the fun. It was the perfect music solution for our outdoor reception. Also, working with you on this has been one of the easiest and most rewarding aspects of our wedding planning. Your pricing transparency, logistics efficiency, hardware quality and customer service could not have been better. We will think of you first when the next silent disco opportunity arises and highly recommend you to others. I’m glad to hear you received them well! Thanks again for an awesome party!! Everyone LOVED it! Everything worked perfectly and it was all so easy to use! Thanks again and we’ll be keeping you in mind for our next silently awesome party. Hello! We had a GREAT wedding!!!!!! Still in the high. And we’re about to ship your box back with 57 headphones all packaged up perfectly! Should go in the mail today. Thank you!!! Johnny we had the BEST time with the silent disco at my diabetes’s party! Thank you so much! We will definitely be ordering from you again. I will get them in the mail today!!! We did the party tonight and it was AMAZING!! Thank you!! The Silent Disco was a HUGE hit at our event and your equipment was very accessible and easy to work with. Thank you for all your help and flexibility, it was a pleasure working with you 😊 Hope you have a lovely week. I am so happy they arrived safe and sound. Thank you for an easy transaction and all of your directions were very clear and easy to follow. The students had a blast. They were not expecting the surprise of a silent party. I look forward to working with you again. Wanted to let you know the headphones were shipped yesterday. They were such a blast! Everyone won’t stop talking about how amazing that party was!! Thanks for all your help with our event, I will recommend you to others who have been asking and will call on you in the future! On behalf of my whole team, we just wanted to say how much me thoroughly enjoyed the Silent Disco. What an absolute blast it was. We didn’t end up opening some of the boxes, but we had about 200 high school students and leaders who still haven’t stopped talking about it. Thank you again for working with us, sorry if our process was a little inconvenient at times. We will definitely recommend you to others! Awesome!! Thank you so much! It was awesome!! The headphones were so easy to use and we had a blast!! Thanks!! The silent disco was great, thanks for providing such good materials. Everything was so easy and worked perfectly. We dropped it off at FedEx yesterday so hopefully everything will be back with you in no time. Hello! Everything went perfectly! Thank you so much for your amazing business, it was a birthday party she will never forget! Everything was so easy to put together and use! I can’t wait for my parents Christmas eve party to party on again! Thank you so much. The party was hit with the headphones. I will be doing more business with in the future. I also gave out your info to others inquiring about the headphones. I dropped the package off at fedex. Please let me know when you receive. Hi Johnny! Had a great time with the headphones….just dropped them off at the local FedEx so they are headed back to you. Pretty sure you will get some referral business as a result of our party. It went perfect. Our guests loved the disco. The equipment was flawless. I will certainly refer you to my friends as well. Thanks!! Thank you so much. I really had a great time using the headphones. All but 5 were used so it was perfect. I gave my friends an experience of a lifetime. They had never been to a silent party so we all had a great time. You may be getting some calls from my friends in the future. Yes! Everyone enjoyed the headphone system! You have a great quality system, sound quality was spectacular. I’ll be renting again from you in the future! Thanks Johnny! Thank you again for your assistance throughout the whole process. I have received the security deposit. Everything went well. My friend and family loved it! The headsets had really good clarity and everything was user friendly. Friends were asking about the headsets for their parties. So, I’ll be sure to give them your info! Just wanted to let you know that we shipped the box back today. The attached pdf has the shipping number for the box. By the way, our event was a hit thanks to your headphones! It was so easy to set up, and everyone had an amazing time. I wanted to let you know that the event went very smoothly– thank you so much for the communicative nature of your responses. I’ll be boxing the equipment up for a return send tomorrow morning. ..I’m glad you received your check! The silent DJ was a HIT!!! About 300 students came at once – many have said it was the BEST night that they’ve had on campus! Thank you so much. I know that we will definitely use your system + headsets again in the future. It was all very easy to operate too. The boxes are set to be mailed tomorrow! Thank you again! Thanks again for the silent headphones – I really like working with your company the best. Everyone had a great time at our brunch and I shipped the headphones, transmitters and cords back today via FEDEX. SUCH AN AWESOME EVENT!!! EVERYONE LOVED IT!!! I have a couple youth pastor friends of mine that will be linking up with you! Also, We are definitely doing this next year!!! I just wanted to say thank you! Thank you for letting us use your equipment and I hope that they have been returned to you, The quality of the headphones were also great and easy to use. The University of Findlay thanks you and hopes we can do this again soon. Awesome! Honestly thank you so much for ALL of your help and your service! You are truly the best! Just dropped the package at FedEx, thank you! The system worked great as usual. I have an idea for another event that I will be in touch about. It came out so good and the kids had so much fun. Next time I’ll do a silent disco (there’ll definitely be a second time) you’re my address. I gave your information to more than a few of our guest. I’m sure we will be reaching out to you again. The silent disco was a major success. Thank you! Would love to use you again in the future! Will send the boxes back to NY first thing tomorrow! I already gave out your name! You were so fantastic to work with and the girls had the time of their lives. I just wanted to let you know our event this weekend went so well. The silent disco on Friday was easily the biggest hit during our weekend long event. Thank you so much! That is great! Yes everything went well. It was the best party we ever had. Thank you so much for being so patient with the process. Your check is in the mail. The event was a hit!! You’ll be getting calls from my colleagues soon. They want to do the same at their schools. I gave you about 4 referrals so far! All within my school district. The headphones worked PERFECTLY! And the event was amazing, thank you so much! Yeah the headphones were a hit! Everyone was impressed with how high quality they were. We will definitely be doing another silent disco at some point in the near future! I will let you know when I drop off the headphones at the post office. I’m glad they made it back okay! Thanks so much for working with us through everything. Everyone had an amazing time and loved the headphones! Once I post pictures, I’ll tag you in them!